They recently unveiled the name of their first child together. As Khloe Kardashian unveils the name of her first daughter, Kourtney's going to be feeling extremely left out that she is the only sister to have named at least two of her children relatively 'normal' names. But that facet currently isn't the thing that's amusing Khloe's fans at the moment. The 33-year-old has revealed that she is naming her baby daughter 'True'. Beautiful. Though fans have noted the irony of that sitution given that her partner and baby-daddy has recently been scrutinised by the press over apparent video footage of him cheating on her. A new Kardashian has arrived, but what does it mean for Khloe and Tristan? Congratulations are in order for Khloe Kardashian and Tristan Thompson, who have just welcomed their first child into the world. But just how much celebrating will there be amid these current cheating rumours? Some reports suggest she has already forgiven him for his alleged behaviour. We couldn't be more happy for 33-year-old Khloe but it's just a shame that she has to experience the most wonderful moment of her life under a black cloud of possible infidelity. Her and Tristan's little girl was born yesterday morning (April 12th 2018) at a Cleveland hospital. Khloe Kardashian Facing Heartbreak Over Tristan Thompson 'Cheating' Footage? She's about to become a mother... and now this? Is Khloe Kardashian set to have her heartbroken once again as she prepares for her first venture into motherhood? It seems some rather unflattering footage has emerged of her partner Tristan Thompson with other women, both when she was around three months pregnant and more recently while she has been preparing for labour. The 33-year-old 'Keeping Up With The Kardashians' star has apparently been in Cleveland getting ready to give birth to her baby girl, and TMZ heard even heard whispers that she went into labour on Monday. Meanwhile, her Cleveland Cavaliers beau has been in New York, getting up to goodness knows what at this point. Continue reading: Khloe Kardashian Facing Heartbreak Over Tristan Thompson 'Cheating' Footage? The Kardashian family has had a number of new additions in 2018 already and the latest of the clan to become a mother is Khloe who is due to give birth to a baby girl – her first child – this week. The younger sister of Kourtney and Kim has revealed who she thinks she will be most like as a parent: mum of three Kim Kardashian West. The Kardashian/Jenners have had an influx of new arrivals in 2018 but, despite baby Chicago and Stormi entering the world in January and February respectively, the famous family are not done yet. The youngest of the Kardashians, Khloe, is expecting her first child in April and rumour has it she added $90,000 worth of gift requirements to her recent baby shower wish list. The Keeping Up With The Kardashians star hosted a lavish party over the weekend to celebrate having her first child with boyfriend Tristan Thompson, and their future daughter will certainly not want for anything - with the mum-to-be trolling luxury boutiques, including Couture Kids, for her new born. Yet another girl to be born into the Kardashian-Jenner family this year. It looks like the Kardashian clan have one more glamorous female to add to their brood this year, as Khloe Kardashian reveals her firstborn will be a daughter. She was actually super shocked at the news, despite it being a fifty-fifty thing, though you would have thought it was about time for a boy to join the family. The 33-year-old revealed the news on 'Keeping Up With The Kardashians', though she admitted that she had truthfully been hoping for a boy. Giving that her sisters Kylie Jenner and Kim Kardashian have also just welcomed daughters, she thought the odds on a son would be a little higher. She's being attacked for flying so far in her third trimester. Khloe Kardashian isn't letting being heavily pregnant get in the way of her travels. She's decided to fly to Asia for a little sisterly trip before she is due to give birth, and she's grateful to be feeling better after a difficult first few weeks. Many fans are not on board with the idea of a trip so far away. The 33-year-old reality star is apparently eight months pregnant with her first child, but that didn't stop her jetting off to Japan earlier this week with sisters Kourtney and Kim Kardashian for a family vacation. The pregnancy seems to be taking a toll on her health. It's safe to say that things are certainly not plain sailing with Khloe Kardashian's first pregnancy. She has seemed happy enough throughout, but now in a recent clip from 'Keeping Up With The Kardashians', it's revealed that she's struggling with some unforeseen complications in her third trimester. The 33-year-old felt lucky to have fallen pregnant by partner Tristan Thompson, after previously being told by doctors that there was a chance she wouldn't be able to conceive. However, as thrilled as they are to have a new baby on the way, it hasn't been without it's difficulties. She isn't taking this kind of slander on her family. Lamar Odom might still harbour strong feelings for his ex-wife Khloe Kardashian, but that did not stop him making a sly dig at her love life during a TV appearance this week. Needless to say, her older sister didn't take kindly to the comment on social media. The 38-year-old former Clippers player took aim at Khloe Kardashian's penchant for basketball stars during an interview on BET's 'Mancave', it being now two years since they initially split. He made the comment after revealing that he still has a tattoo dedicated to her. She still won't tell us what's going on with Kylie though. Khloe Kardashian finally confessed that she was pregnant for the first time in the final week of 2017, and this week she went on 'The Ellen Show' to open up about all things baby-related from cravings to names. But she's still keeping schtum on Kylie Jenner rumours. Asked if she'd experienced any sickness yet, Khloe admits that it's so much harder at the beginning when it's not totally obvious that you're expecting. Though now, of course, she's finding herself getting out of breath very easily. The reality star is six months pregnant with her first child. Khloe Kardashian has hit back at critics of her pregnancy workouts, saying her routines have been approved by her doctor. The 33-year-old told to Twitter on Tuesday to respond to the critics, after she shared a series of workout videos on Christmas Eve. “For the ones who think they are physicians all of a sudden,” Khloe tweeted. “MY doctor and I communicate and my workouts are cleared and highly recommended. Khloe Kardashian has confirmed she’s expecting her first child with boyfriend Tristan Thompson. There’s nothing but love between the Kardashian sisters. Khloe Kardashian took to Twitter on Tuesday to try and end any beef between her stans and those of older sister Kim. The reality star assured her following that she and her sister were each other’s biggest fans and that there needs to be peace between the fandoms. The reality star is rumoured to be expecting her first child, a girl, due in February. Fans who are waiting on Kylie Jenner to confirm her rumoured pregnancy might have a while to go yet – three months to be exact. According to People magazine, the 20-year-old is not planning to confirm her pregnancy until she actually gives birth. Since the pregnancy rumours started, Kylie has been keeping an uncharacteristically low profile and now sources say it’s all part of a six month break from the spotlight. The excitement surrounding the Kardashian/Jenner sisters following the pregnancy rumours of Khloe and Kylie has since turned to desperation by fans to catch a glimpse of the siblings and their bumps. 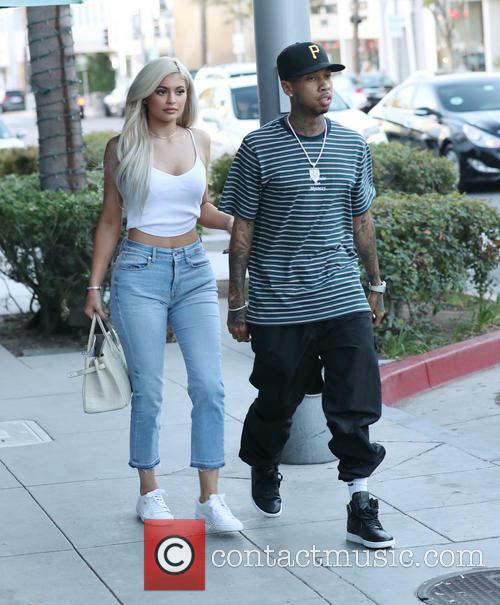 However, the youngest sibling allegedly pregnant, Kylie, has hit out at media organisations who have taken a recent picture of her and accused them of photoshopping the image. The 20-year-old was pictured boarding a private jet with her sisters Kendall Jenner and Kourtney Kardashian on Sunday morning and the snaps appeared to show the reality star with a baby bump under her baggy hoodie and jogging bottoms.